BEREA — Alexandra Winkelfoos of Mount Gilead was crowned homecoming queen during Baldwin Wallace University’s combined homecoming and Community Day, newly dubbed as the Bold & Gold Festival. 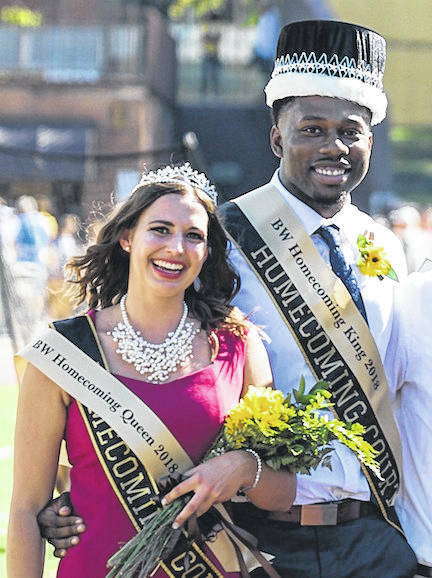 Winkelfoos, a graduate of Highland High School majoring in communication studies, was crowned at halftime along with homecoming king Milton Woods of Chicago. She was nominated by the student organization Best Buddies Baldwin Wallace. The epic gathering of the BW community — students, alumni, parents, local neighbors, friends, and current and retired faculty and staff — included a pep rally, parade, tailgate picnic, alumni reunions and Yellow Jacket football. Highlights of the weekend were the crowning of the Jacket Prince and Princess during the pep rally and the homecoming king and queen at halftime.